For the Paper Porcelain tableware series, designers Stefan Scholten and Carole Baijings sought to translate paper models—an integral part of their design process—into porcelain. First, they sketched the forms, geometry, and color of the cups and saucers. The two-page concept drawing below, in Cooper Hewitt’s collection, was cut from the designers’ Moleskine sketchbook and dates to an early period in their design process, before they produced three-dimensional prototypes. Baijings tends to draw the cups, and Scholten draws the saucers. Next, they created three-dimensional concept models out of cut, folded, scored, and taped cardboard. The concept model below, also in Cooper Hewitt’s collection, demonstrates the precision and charm of the concept models. Finally, the cardboard concept models were painstakingly reproduced as unglazed porcelain prototypes. The designers developed a special porcelain mix to which they added metal drill dust, recreating the cardboard’s spotted, gray color. Strips of paper tape on the cardboard models were recreated using ceramic glazes. Pencil lines applied by hand to the porcelain prototypes indicated the scored lines of the cardboard. 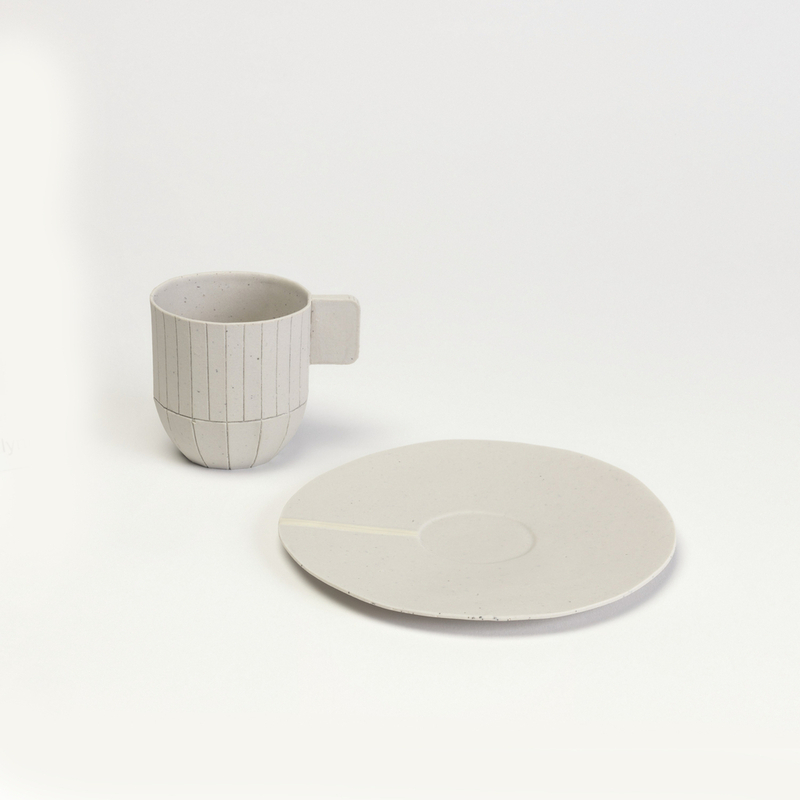 The final tableware manufactured by Hay is made of molded and glazed porcelain, and faithfully mimics the spotted gray of the original cardboard and the beige paper tape. Andrea Lipps is Assistant Curator of contemporary design at Cooper Hewitt, Smithsonian Design Museum.